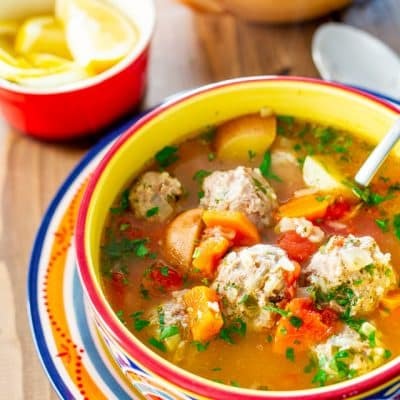 An incredible Albondigas soup which is a traditional Mexican meatball soup loaded with vegetables and full of flavor. In a bowl add all the meatball ingredients together and mix well. Shape into meatballs about 1 inch in diameter. You should get about 25 to 30 meatballs, depending on how big you make them. Place meatballs in fridge until ready to add to soup. Heat the olive oil in a heavy bottom 5 qt pot to medium heat. Add onions and garlic and cook until onion is translucent, being careful not to burn the garlic. Add chopped carrots and potatoes to pot and cook for about 3 to 5 minutes until you get a nice caramelization going. Add the tomatoes, broth, water and seasonings. Bring to a boil and turn down heat and let simmer for about 5 minutes. Add meatballs to pot one at a time, slowly. Using a wooden spoon slowly stir. Cover and let cook over low to medium heat for another 15 minutes or until meatballs are cooked through. Add lemon juice and herbs and taste and adjust for seasoning. If you have extra meatballs or don't use them all, you can place them in an airtight container and freeze them until ready to use.